Markets finally had an up day after a steep decline earlier. Wall Street pulled off a big turnaround Thursday, rebounding from a steep early drop to finish modestly higher. Investors who began the day worrying about a revival of the banking crisis grew optimistic during the session that the government will again help the financial industry. News that Bank of America Corp. needs another government cash infusion started the selloff, which had the Dow Jones industrials heading for a seventh straight loss. Speculation about a pending Senate vote on authorizing the remaining $350 billion from the government's financial bailout fund lifted the market. Observers say the outcome of the vote was too close to call. But investors were hoping additional money from Washington will help stabilize banks. The market's zigzag was reminiscent of the enormous volatility seen in September and October when worries about mounting troubles at banks and the collapse of brokerage Lehman Brothers Holdings Inc. pummeled Wall Street. Swings of hundreds of points in the Dow industrials were terrifying but began to feel almost commonplace. In the months since, Wall Street has shown relative calm but still remains in a bear market, which can produce sharp turns. Some analysts attributed the comeback to the market's own dynamics. 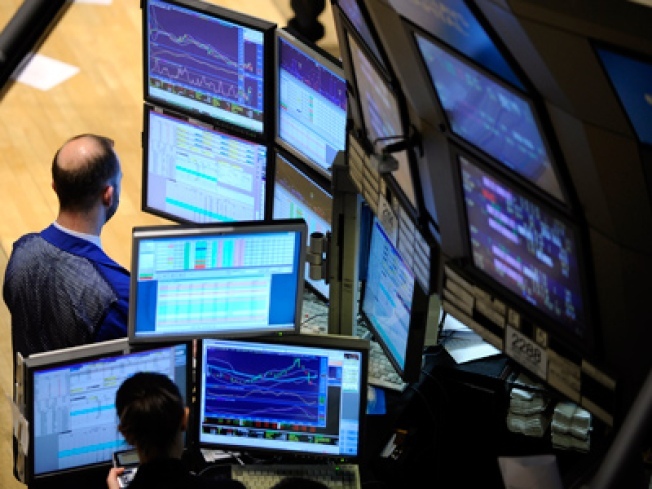 Joe Saluzzi, co-head of equity trading at Themis Trading LLC, said the recovery in stocks was overdue given the market's 10 percent slide in the past week, and he said traders were looking for any reason to rally. Saluzzi said investors might ultimately be disappointed by the government's efforts to boost the economy but that headlines about broad spending were enough to prod the market. "That's the spark on top of the timber. That gets it going. That's all you need to get the market going," he said, referring to Washington's plans. "I think, bottom line, it's an oversold bounce. We'll see if it lasts." Wall Street is nervous that the money already given to banks during the fall has done little to repair their balance sheets. The federal government is considering a fresh multibillion-dollar aid package for Bank of America to help it absorb losses at Merrill Lynch, according to a person with knowledge of the discussions, who spoke to The Associated Press on condition of anonymity because of the sensitive nature of the discussions. Bank of America acquired Merrill Lynch on Jan. 1. The person said the new aid package could be modeled along the lines of the financial lifeline that was thrown to Citigroup Inc. in November. Other media organizations have had similar reports of a potential aid package for the company. There are also expectations that Citigroup will be announcing further steps to slash costs and reduce the company's size because of its financial problems and that other banks could require more government help. "People seem to be fearing the financials again, fearing that they are going to need more funding," said Uri Landesman, head of global growth strategies at ING Investment Management. "There is this perception that at some point there is value, a belief that the markets are oversold," he said. According to preliminary calculations, the Dow rose 12.35, or 0.15 percent, to 8,212.49 after falling the past six days. The Dow was down as much as 205 during the session and briefly slipped below the 8,000 mark. That was the first move below that psychological benchmark since Nov. 21, a day after the blue chips closed at their lowest level in more than five years. Broader stock indicators advanced Thursday. The Standard & Poor's 500 index rose 1.12, or 0.13 percent, to 843.74 and the technology-heavy Nasdaq composite index rose 22.20, or 1.49 percent, to 1,511.84. The Russell 2000 index of smaller companies rose 9.45, or 2.09 percent, to 462.62. Tech and small-cap stocks are often among the first places investors start buying when they think a recovery is at hand. The Dow's bounce off the 8,000 level was a welcome move by traders hoping stocks can remain above their November lows. At their weakest point Thursday, the Dow and S&P 500 index were down more than 11 percent in seven sessions. The number of stocks rising on the New York Stock Exchange outpaced those declining by about 8 to 7. Earlier decliners led gains gainers by 10-to-1. Volume came to 1.65 billion shares compared with 1.42 billion shares traded Wednesday. Bond prices were mixed as stocks recovered. The yield on the benchmark 10-year Treasury note, which moves opposite its price, rose to 2.21 percent from 2.20 percent late Wednesday. The yield on the three-month T-bill, considered one of the safest investments, was unchanged at 0.10 percent from late Wednesday. Light, sweet crude fell $1.88 to settle at $35.40 a barrel on the New York Mercantile Exchange. The Bank of America news more than offset any positives from a better-than-expected earnings report from JPMorgan Chase & Co. The banking company managed to avoid a loss, reporting earnings of $702 million in the October-December quarter. Analysts had predicted the company would break even. Bank stocks still declined as the rest of the market recovered. Bank of America fell $1.88, or 18 percent, to $8.32, while Citigroup slid 70 cents, or 15 percent, to $3.83. Morgan Stanley fell 93 cents, or 5.4 percent, to $16.26. JPMorgan fell $1.57, or 6.1 percent, to $24.34. Jerome Booth, head of research at Ashmore Investment Management Ltd. in London, said banks will need additional government money if they are to resume more normal levels of lending. He contends increased funding is more urgent than a fiscal stimulus plan under consideration in Washington to help boost the economy. He said the economy will continue to struggle for years because ridding excess debt in a process known as deleveraging is necessary but painful. "Fiscal policy is very important but it's not really the main issue. The main issue is to get the banking system working again because at the minute we've got a deleveraging going on but we've also got massive cardiac arrest in the banking system." Booth said banks will need far more money. "Arguably they've still only got 50 percent of the capital they need," he said. Wall Street is concerned about the financial industry but is also looking at other parts of the economy. Investors were awaiting quarterly results from Intel Corp. The world's largest maker of computer chips had already warned investors that its fourth-quarter revenue would fall short of its initial estimates. After the closing bell Intel said its fourth-quarter earnings fell 90 percent. But results were still in line with Wall Street's modest expectations. Intel ended regular trading up 21 cents, or 1.6 percent, at $13.29. Apple Inc. fell $1.95, or 2.3 percent, to $83.38 after announcing Wednesday that Chief Executive Steve Jobs would go on medical leave until at least June. The announcement came a week after the Apple co-founder insisted he would stay with the company. Overseas, Britain's FTSE 100 fell 1.42 percent, Germany's DAX index declined 1.94 percent, and France's CAC-40 fell 1.84 percent. Japan's Nikkei stock average dropped 4.92 percent.